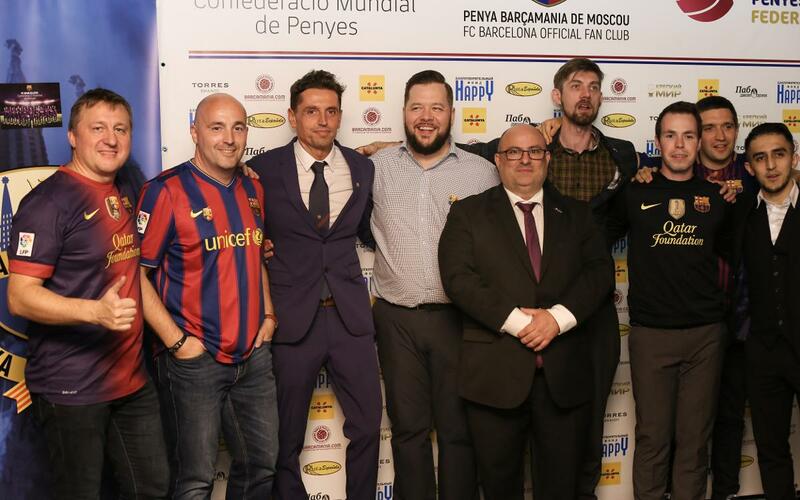 Last weekend the inauguration ceremony of the Penya Barçamania de Moscou was held in Pub John Donne Pub in the city. The event was attended by Jordi Gratacós, Technical Director at Barça Academy Moscow, and Antonio Freire, President of the World Zone Federation of Penyes. The ceremony kicked off at 14:00 on Saturday 29 September with the arrival of the club representatives, who were welcomed by Alexey A. Stepanov, president of the Penya Barçamania de Moscou; George Nemikyn, president of the supporters club in St Petersburg and Levon Srobyanb, president of the Osos Rusos (Russian Bears) Penya in Noginsk, among other guests connected with the supporters movement in the country. After the traditional round of greetings between the Catalan and Russian institutional representatives, the event continued with a buffet-style meal that got members of the penya and other guests alike involved in the proceedings. There were plenty of surprises in video form throughout the day, including a presentation of the new penya. Meanwhile, FC Barcelona honoured the inauguration with a video message from Jordi Cardoner i Casaus, First Vice-President of FC Barcelona. The Moscow penya presented a series of initiatives, such as its official website; the only Russian language site dedicated to FC Barcelona and its world, various future activities and the club's own football team. These projects not only reflect how active the members are, but also their caring side, in the form of the "Happy" Charity Fund that they are setting up. The meeting could not have ended in finer fashion. At 5.15pm, local time, everyone gathered to watch the FC Barcelona v Athletic Club game, a wonderful chance for everyone to share their love of the team.